Cu Chi District is known nationwide as the base where the Vietnamese mounted their operations of the Tet Offensive in 1968. The tunnels are between 0.5 to 1m wide, just enough space for a person to walk along by bending or dragging. However, parts of the tunnels have been modified to accommodate visitors. The upper soil layer is between 3 to 4m thick and can support the weight of a 50-ton tank and the damage of light cannons and bombs. The underground network provided sleeping quarters, meeting rooms, hospitals, and other social rooms. Visiting the Cu Chi Tunnels provides a better understanding of the prolonged resistance war of the Vietnamese people and also of the persistent and clever character of the Vietnamese nation. 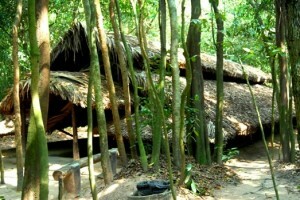 For a place that’s physically invisible, the Cu Chi Tunnels have sure carved themselves a celebrated niche in the history of guerilla warfare. Its celebrated and unseen geography straddles “all of it underground” something which the Americans eventually found as much to their embarrassment as to their detriment. They were dug, before the American War, in the late 1940s, as a peasant-army response to a more mobile and ruthless French occupation. The plan was simple: take the resistance briefly to the enemy and then, literally, vanish. First the French, then the Americans were baffled as to where they melted to, presuming, that it was somewhere under cover of the night in the Cuu Long (Mekong) Delta. But the answer lay in the sprawling city under their feet – miles and miles of tunnels. In the gap between French occupation and the arrival of the Americans the tunnels fell largely into disrepair, but the area’s thick natural earth kept them intact and maintained by nature. In turn it became not just a place of hasty retreat or of refuge, but, in the words of one military historian, “an underground land of steel, home to the depth of hatred and the incommutability of the people.” It became, against the Americans and under their noses, a resistance base and the headquarters of the southern Vietnam Liberation Forces. The linked threat from the Viet Cong – the armed forces of the National Liberation Front of South Vietnam – against the southern city forced the unwitting Americans to select Cu Chi as the best site for a massive supply base – smack on top of the then 25-year old tunnel network. Even sporadic and American’s grudgingly had to later admit, daring attacks on the new base, failed for months to indicate where the attackers were coming from and, importantly, where they were retreating to. It was only when captives and defectors talked that it became slightly more clear. But still the entries, exits, and even the sheer scale of the tunnels weren’t even guessed at. Chemicals, smoke-outs, razing by fire, and bulldozing of whole areas, pinpointed only a few of the well-hidden tunnels and their entrances. The emergence of the Tunnel Rats, a detachment of southern Vietnamese working with Americans small enough to fit in the tunnels, could only guess at the sheer scale of Cu Chi. By the time peace had come, little of the complex, and its infrastructure of schools, dormitories, hospitals, and miles of tunnels, had been uncovered. Now, in peace, only some of it is uncovered as a much-visited part of the southern tourist trail. Many of the tunnels are expanded replicas, to avoid any claustrophobia they would induce in tourists. The wells that provided the vital drinking water are still active, producing clear and clean water to the three-tiered system of tunnels that sustained life. A detailed map is almost impossible, for security reasons if nothing else: an innate sense of direction guided the tunnellers and those who lived in them.